A friend of mine volunteers for Strive, an organization that provides after-school tutoring for disadvantaged kids here in Chicago. Services like Strive are in increasing need, because the Chicago Public Schools have drastically cut their budget for tutoring. Every year, Strive holds a fund-raising party that includes a silent auction. I couldn't attend the party this time, so I volunteered to knit something to be auctioned off. I got the bright idea to make a circle scarf, since they're so trendy right now, but I really didn't like how it turned out. It looked much better in my head than it did in reality. So I decided to also make an Elizabeth Zimmerman Pi shawl out of some alpaca lace yarn I had left over from another project. I love how thin and delicate it was after blocking. I tried to photograph it hanging up in my window, but it's so thin that it didn't even show up against the window. This little beauty fetched $80 at the auction. I let my friend have the circle scarf, too, and it brought $40, which shocked the heck out of me. Anyway, I'm proud that someone wanted both items and I feel good that I was able to contribute to such a worthwhile charity. Very pretty! Next time your friend needs donations please let me know. I love making stuff for charity. that was so generous of you. 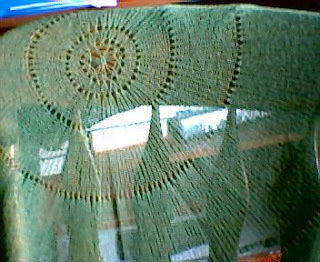 the shawl is gorgeous. i can also knit something for charity if you need. Thanks, Lynette! I was very pleased with how it turned out. I know my friend would be thrilled to get some more donations, so knit away!